FREDERICK JUDD WAUGH was born into an artist’s family. His first teachers were his father, Samuel B. Waugh, a respected Philadelphia portrait painter, and his mother, Mary Eliza Young Waugh, a miniaturist. With encouragement from his parents, he attended the Pennsylvania Academy of the Fine Arts, where he studied with Thomas Eakins and Thomas Anshutz. After three years, he left for Paris, where he entered the Académie Julian and studied under Adolphe William Bougereau and Tony Robert-Fleury. In 1883, while he was still a student, his work was accepted for the Paris Salon. His father’s death in 1885 brought him back to the United States, where he spent the next seven years doing commercial work and painting some portraits. In 1892 he returned to Paris. Waugh remained in England for twelve years, working as an illustrator for various newspapers and magazines in London, and returning to Saint Ives to paint when time allowed. In 1907 Waugh returned to the United States, eventually settling in Provincetown, Massachusetts. He was elected a member of the National Academy of Design in 1911. For five consecutive years he was voted the favorite artist of the prestigious Carnegie International Exhibition in Pittsburgh. 1. George E. Havens, "F.J. Waugh: America's Most Popular Marine Painter," American Artist (January 1967): 30-37. also, see Havens, Frederick J. Waugh: American Marine Painter, Orono: University of Maine Press, 1969. 2. Gary A. Hood, "Majesty in Motion," exh. brochure, for Smith-Kramer, Kansas City, Missouri, n.d.
3. Harold Nelson, Sounding the Depths: 150 years of American Seascape. New York: American Federation of Arts, 1991: 47. 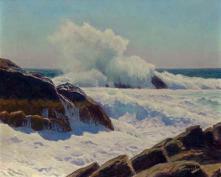 Nelson suggests that this close-up of the water gives the impression that the artist is standing in the surf as he paints. Submitted by the staff of the Columbus Museum, Georgia. He was a member of the Royal Academy, Bristol, England; Associate (1909) and Academician (1922) of the National Academy of Design; Salmagundi Club; Lotos Club; National Arts Club; fellow, Pennsylvania Academy of Fine Art; Boston Art Club; Connecticut Academy of Fine Arts; Washington Art Club; North Shore Art Association (1924); American Federation of Art; and more. Awards include medals at the National Academy (1910, 1929, 1935); Buenos Aires Exposition (1919, gold); Boston Art Club; Art Institute of Chicago (1912); Conn. Academy of F.A. (1915); Pan-Pacific Exposition (1915); Philadelphia Art Club (1924, gold); Carnegie Institute; and Buck Hill Falls Art Association (1935). His work is represented at: the Metropolitan Museum of Art; Art Institute of Chicago; National Gallery of Art, Wash., D.C.; Brooklyn Institute Museum; Terra Museum of Art; Montclair Art Museum; Walker Art Gallery, Liverpool; Durban Art Gallery, South Africa; Dallas Art Association; Austin Art League; City Art Museum of St. Louis; Pennsylvania Academy of Fine Art; Currier Gallery, Manchester, NH; the Edwin A. Ulrich Museum, Hyde Park, NY and more.